Marrakesh is a city for the senses. The scents, colors and sounds will mesmerize you. If you're looking to stay near all of the action, it's best to center yourself around the famous Djemaa el Fna Square, which is just inside the city's impressive medina. 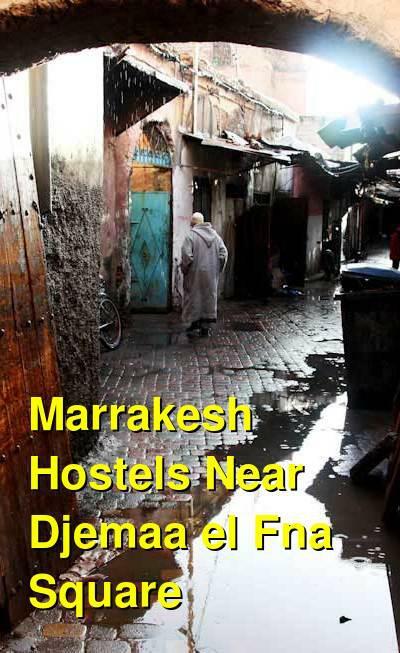 There is plenty of accommodation scattered around this area and you can find anything from budget hostels and hotels to fancy riads. If you're hoping to make the most of your time in Marrakesh, then this is definitely the place to stay. This hostel focuses on social responsibility and sustainable development. It is a good option for solo travellers, independent travellers, and small groups. Created as a budget hostel by the developers of some higher-end hotels, the Kaktus Hostel is a self-proclaimed "economical and socially responsible property.... it is a place of experimentation into sustainable development, as well as a place for artists and culture to thrive." Set in a traditional riad with an open courtyard in the center, the building is about 100 meters from the central square. In the heart of the old Medina, you are close to the culture, action, restaurants, shops, and sights of the city. Even better - the management of the hotel offers an amazing traditional breakfast as well as other meals. You will surely get your fix of amazing Moroccan food here! Other amenities available to guests include games, air conditioning, television, a bar, and free WiFi/internet. They can also arrange tours and excursions (not that you'll have trouble finding someone to do that for you in Morocco). This family run hostel is good for solo travellers, couples, and small groups. This beautiful and imaginative riad is just one minute from the city's main square. It has a fun and colorful atmosphere with the quintessential courtyard and fountain in the center. There's a dining area and roof terrace. You can choose between private rooms and mixed dorms based on your personal budget and travel style. The dorms have four beds and a bathroom. There is air conditioning, but an additional fee will be charged if you choose to use it. The central location means you can walk to many different destinations. These include a five minute walk to Merdersa Ben Youssef and the Musee de Marrakech as well as a five minute walk to the Koutoubia Mosque, gardens and cyber park. This is a nice hotel for solo travellers or couples. The Hotel Cecil is located right on the Djemaa El Fna square and offers guests a wonderful rooftop terrace that looks out on all of the action. You can watch the square come to life with food carts and street performers from your hotel. It's perfect for people who want to be in the middle of everything. 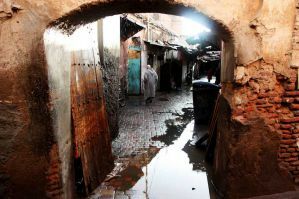 From here you can stroll through the medina and get lost in all of the alleyways and shops. The rooms have modern furnishings that are decorated in a Moroccan style. There are rooms available with air conditioning upon request. You can choose between private and shared bathrooms depending on your budget as well. Included in the price of the room is a complimentary breakfast which is served on the rooftop terrace as well as in the ground floor courtyard. Within minutes of the hotel you'll find plenty of restaurants, cafes and attractions. It's easy to stay entertained here regardless of what your interests are. This is a nice hostel for solo travellers, couples, or groups. Rainbow Marrakech is the perfect option for backpackers who are looking to meet other travelers and share stories. It's located right near the city's main square and has a mellow environment where many guests enjoy hanging out. The hostel is run by two local men who know the area well. They know the ins and outs of the medina and can offer excellent advice to help you get off the beaten path. There is plenty of organized activities that make it easy to meet other guests. There are three types of dorm rooms available. You can choose between rooms with five, four, or three beds. There are also private rooms available of varying sizes. Complimentary breakfast is provided.